Sometimes, life will throw you such a curveball that you’ll wonder how it could ever be possible that there is a god. And then, there are days like this, of incredible coincidence and random, lucky encounters that you think, if Nietzsche was here, even he would bow down to whatever higher power that led us to the feijoada that we had this afternoon. Our story begins with a friendship we struck up with Isabela, who works at the wonderful Copenhagen Coffee Lab (article of appraisal soon to follow) and who had previously come to our place for a Korean dinner. Hey, you know you guys can invite yourselves too, right? Wanting to return the favor, Isabela, who is from Brazil, decided to generously share with us a piece of Brazilian culture: feijoada, a stew with meat, sausage, meat and offal (in a way, a very economical dish) and black beans, loads of them. It doesn’t look very appetizing, but if well made, the results can be extremely satisfying. 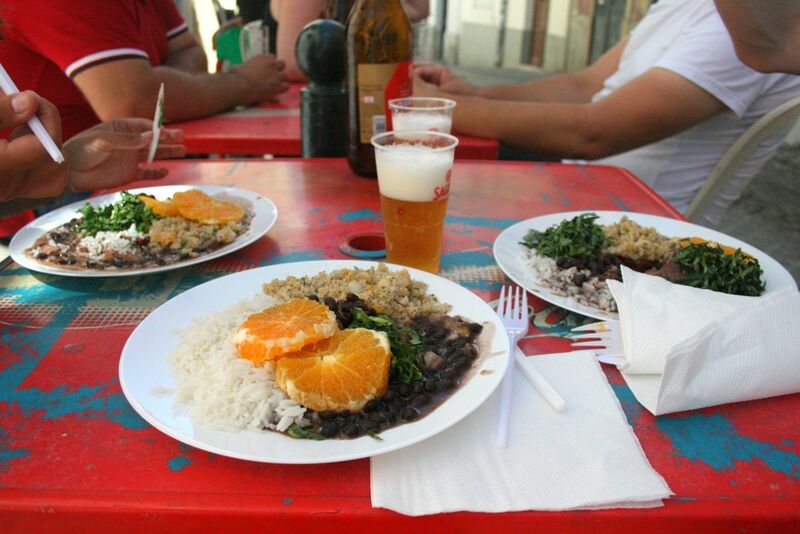 The nearest equivalent to a Portuguese dish would be the “feijoada transmontana”, which in all honesty, I haven’t quite worked out the exact difference with the Brazilian one, except that you don’t get as many trimmings, none actually, bar the rice. So, it took us a taxi ride from Principe Real all the way to Arroios to realize that Katia Brasil, the restaurant Isabella wanted to take us to and which claimed on facebook to be “always open”, was actually closed. Desperate for food, we decided to turn back to Principe Real (it was a good day to be a cab driver in Lisbon I would guess) and find something there. However, finding a restaurant in Lisbon on a Sunday afternoon can be trickier than finding a pink elephant walking around the streets of Lisbon in a tutu carrying a bag of pasteis the Belem. We went to our favorite places: closed. Checked online for new places we hadn’t even been to and said online that they were opened: closed. Everything we wanted was closed. Going back to the Copenhagen Coffee Lab where Isabela had just finished her shift and have lunch there became a retreat too pathetic to even consider. Deep despair that we would never eat anything anymore for the rest of our lives took hold of us. Then it happened. 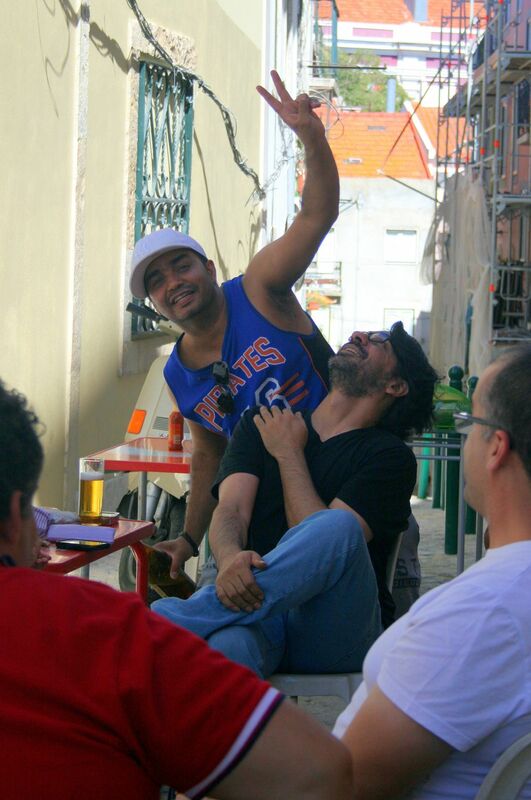 In a side street of the Rua São Marçal, another street full of closed restaurants, we stumbled upon some tables standing outside. Thinking that it was probably just some people from the street barbecuing outside, Isabela needed no more than the slices of oranges and the kale to shout out “feijoada”. That it was. Angels sang softly in the distance. Whatever an apocalypse is, this was the exact opposite of it. The stars had aligned for us, very much like the tables outside which belonged to the Brazillian café / bar / concert space KLG studio, and every other Sunday they serve a typical Brazilian dish. Hallelujah! Yes, we were hungry, but that was a feijoada done right, with all of the trimmings: rice, green raw kale (which you’re supposed to mix in with the feijoada), slices of orange (I was not a fan at first, but am now convinced of how the delicious sweet-tartness of the orange cuts wonderfully through the very rich meat and bean stew) and the best farofa. And the stew, the star of the whole dish was everything one could wish for: gelatinous meat, smoky sausage, rich bean flavours. A beer, a chat with some local fans of the bar sitting outside, and the afternoon was perfect.